Peter Kearl is co-founder and CTO of Qmast which is a Colorado-based company pioneering the use of the microwave technology to recover oil. Oil giants BP and ConocoPhillips are pouring resources into developing similar extraction techniques, which can be far less water- and energy-intensive than fracking. The Green river formation is the world’s largest known deposit of kerogen-rich rock and covers Colorado, Utah and Wyoming. This is oil shale. 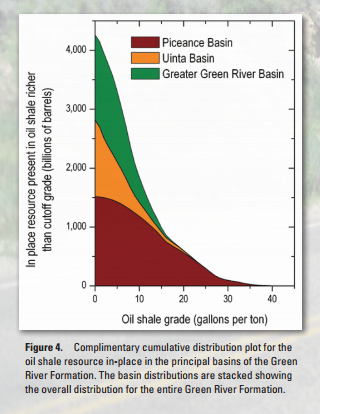 Oil shale is not shale oil. Shale oil is essentially liquid oil locked up in rock that’s found in deep formations and requires hydraulic fracturing, or fracking, for it to flow freely to the wellbore for extraction. Oil shale, on the other hand, isn’t really oil yet. Instead, it is found in more shallow formations that contain solid organic materials called kerogen. Oil shale must be heated to get oil out of it. Producers would microwave oil shale formations with a beam as powerful as 500 household microwave ovens, cooking the kerogen and releasing the oil. It also would turn the water found naturally in the deposits to steam, which would help push the oil to the wellbore. “Once you remove the oil and water,” Kearl continues, “the rock basically becomes transparent” to the microwave beam, which can then penetrate outward farther and farther, up to about 80 feet from the wellbore. It doesn’t sound like much, but a single microwave-stimulated well, which would be drilled in formations on average nearly 1,000 feet thick, could pump about 800,000 barrels. Qmast plans to have its first systems deployed in the field in 2017 and start producing by the end of that year. Qmast estimates his pumping costs will be about $9 per barrel, which is only about $2 more than conventional wells. Qmast would be to lower a high-power, 2.45-gigahertz emitter – essentially a supercharged microwave oven – into the ground. The idea that a microwave antenna might do the job has actually been around for a while. However, equipment that can create, steer and stabilize the beam was too bulky to fit down a narrow well. Now, designs that will soon make the technology cheap and commonplace are emerging from small outfits, including one Kearl has set up, and from the defense industry. Kearl thinks there is another, immediate use for his technology: to unblock existing oil and gas wells that have become too sluggish to be worth operating. In oil wells, this happens when paraffin wax and other impurities build up in the conduits to the pipe. Similarly, fracking well production declines quickly when the shale absorbs water, causing the rock to swell and squeeze into the fractures and block the gas’s exit. Many of these wells are abandoned despite there being . plenty of remaining oil or gas, and new wells are dug. 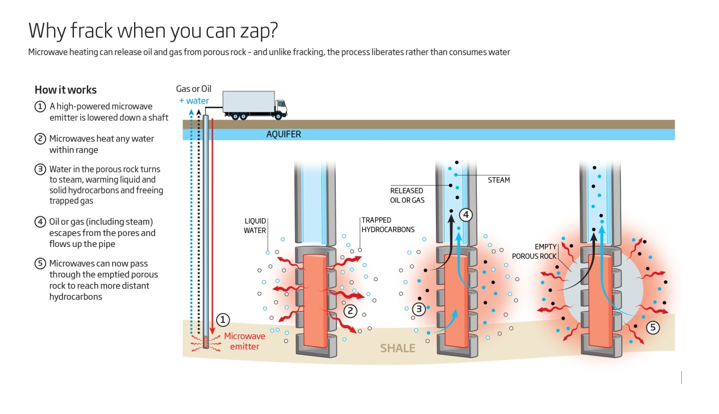 If microwaves can melt paraffin and boil off water, blocked wells will flow like new. “They could be effectively rehabilitated by microwave heating,” says Kearl. This could help protect environmentally sensitive areas. “If we can produce more oil from old wells, that would lessen interest in drilling for new sources of oil,” says Stephen Brown, an energy economist at the University of Nevada, Las Vegas. John Robinson and his colleagues at the University of Nottingham, UK, are developing a system to dislodge oil trapped in drill cuttings, the contaminated sand left by the drilling process in a conventional well. When the team zaps the mix with microwaves, the heating of any water mixed in with the heavy oil makes oil dribble out, leaving basically clean sand. BP has funded Robinson’s team to extract oil from cuttings left by its ocean platforms, making the cuttings safe to put back into the ocean. The same process can coax oil from tar sands, a forbidding mixture of sand, clay, water and bitumen – a heavy oil sludge that has resisted all efforts to pump it from the sands. “Low-grade” tar sands reserves might be recovered by zapping – thanks to their payload of water, trapped in this case within the crystal structures of small particles called clay fines. Robinson says his group’s long-term goal, like QMast, is to use microwave heat for large-scale production of hydrocarbons. When Robinson’s technique turns the water in tar fines to steam, it yields not just oil but water pure enough to drink. Tar sands are only about 1 per cent water, but oil shale’s water content can approach 20 per cent. Current methods of oil and gas extraction use two to five barrels of water per barrel of oil produced, says Eleanor Binner, an engineer on Robinson’s team. 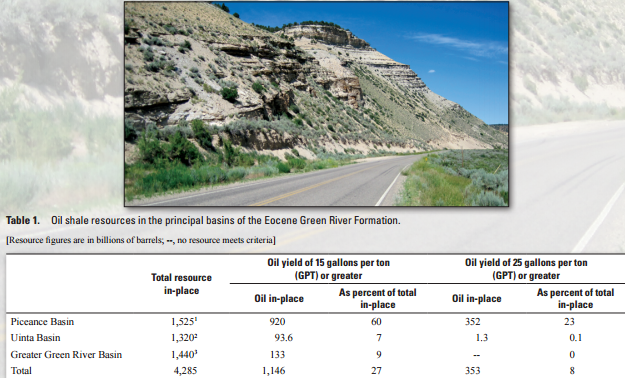 By contrast, Kearl says, oil-producing rocks – for example the Green River formation in the western US, which contains the largest oil shale deposit in the world – would yield a barrel of water for every two barrels of oil. “The hydrocarbons and water can be easily separated once condensed,” says Robinson.